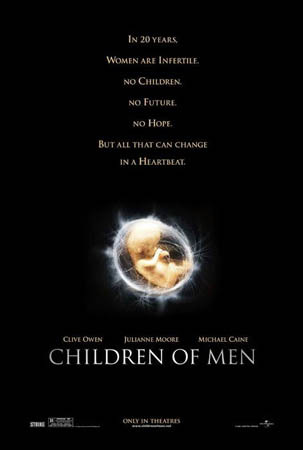 Best Feature-Length Film: Children of Men - Not only for its staggering technical achievements, but for its captivating story, marvelously told, which inspires genuine hope even in the bleakest of possible futures. Best Lead Performance, Male: Hugh Jackman, The Fountain - For being unafraid of looking silly while doing tai chi in space, and for creating as authentic a portrait of grief as I've ever seen. Best Lead Performance, Female: Laura Dern, Inland Empire - The word "courage" is overused in describing performance, but it completely applies to Dern, who throws herself completely into David Lynch's hall of mirrors. Best Supporting Performance, Male: Jack Nicholson, The Departed - People who complain that this is just "Jack being Jack" are boring. Best Supporting Performance, Female: Fiona Shaw, The Black Dahlia - Probably the most entertaining performance this year. Over the top? Yes, exactly. Best Direction: Alfonso Cuaron, Children of Men - Cuaron just made a huge leap from a great up-and-coming director to one of the most important voices in cinema today.